Today's lesson is a basic one, but oh so important. Whenever I alter someone's clothes, my rule of thumb is to put things back the way I found them. 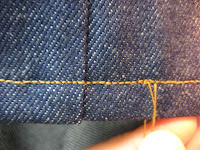 If the hem is hand stitched, I hand stitch the shortened pants. 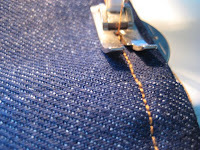 If the hem was topstitched, I topstitch the replacement hem. I like do my alterations in such a way that you can't tell that the garment has been changed. That means I use thread that matches the thread I just took out. This is especially important on jeans. That gold thread that is so common is available at some fabric stores, and many notion retailers online. We are lucky in Cincinnati to have a warehouse of sewing notions that is local. They have several shades of jean thread from which to pick. 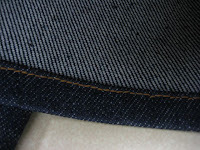 Make a skinny (½") hem here and use matching thread and your customer will never know the difference.